and end times for each school site and details about the school transition plan. Update your family and student information for the new school term online. All students attending Glenpool School District can be updated at one time. Get a jump on this end of the year task and click the link below to complete your family update today. Glenpool Elementary School received the Award of Excellence for being a 2018 Oklahoma Certified Excellent Healthy School. Oklahoma School Testing Program (OSTP) and College and Career Ready Assessments (CCRA) will take place across our state in April. The Oklahoma State Department of Education has resources that are helpful for parents and students alike. Parent, Student, Teacher Guides (PSTG) are available for every tested grade and subject and may be accessed from our website. The state has also provided online practice tests to help students get comfortable with the format and flow of the online platform. Encourage your students to do their best. Kindergarten students who will enter Glenpool Public Schools for the first time for the 2019-2020 school term should pre-enroll now. Make an appointment online now and complete the enrollment forms online before coming to the Enrollment Center located at the Education Service Center, 140 W 141st St. Pre-enrolling now helps Glenpool plan and prepare for next year. Students who currently attend Glenpool's Preschool program are automatically pre-enrolled for Kindergarten for the 19-20 school term. The district is looking for individuals who are interested in driving a school bus. This part-time employment opportunity allows you to assist the district in providing quality transportation for our students. The transportation department will assist interested individuals through training and in attaining the necessary certification. Please contact Jonna Roberts, 918-322-9500 x509, if you are interested or would like additional information. Online applications for preschool enrollment are now available. Make an appointment online now to enroll your child for the 19-20 term. For a complete list of required documents or enrollment applications in Spanish or Zomi, visit the Student Enrollment webpage. Preschool will be located at the new Glenpool Lower Elementary School located at the corner of 141st St and Elwood. Preschool space is limited, so please enroll your student during the pre-enrollment period, March 25 - April 5. Trees are budding, flowers are beginning to bloom and kids are outside playing in the yards. The sights and sounds of Spring are here. Don't let Spring fever tempt your student to stay home. Everyday something positive happens in school. The mission: Graduate looks at elementary, middle school, and high school students and their parents all on the mission to graduate. GPS uses Common Sense Media to teach students about Digital Citizenship in the classroom. This site also offers great resources for parents to help you navigate the digital world safely for your children of all ages. Click here for ways to make YouTube safer for children and teens. Don't miss the fun, food, free face painting, and a chance to win Whataburger for a year as we raise funds to support teacher-classroom grants awarded by the Glenpool Foundation for Academic Excellence. Dine in and drive through. Whataburger will donate 20% of sales to the Foundation. Glenpool Public Schools uses email and text messages as a primary communication tool. Text messages specifically are used to alert parents of negative meal balances so you will always beware of your student's meal status. They are also used to alert parents of school and event closures, bus route delay times, and emergencies. Text messages are delivered by School Messenger and parents/guardians must "opt in" to receive texts by using the code shown above. Read more about the school transition plans in Superintendent Olansen's message. This special recognition is given to high school juniors and seniors who meet certain criteria of academic classes taken, extracurricular activities, awards and acceptances into juried state art show. GHS students have the opportunity to be part of a Grief Counseling group during Warrior Wednesdays from April 17-May 22. The group will be facilitated by experienced counselors from the Tristesse Grief Center. The sessions are completely free of charge to students. Glenpool School District will offer free lunches for all children under 18 years of age regardless of school membership. All children will be served in the Warrior Cafe at the middle school May 28 - August 8. Mark your calendars now and plan to have lunch with us! This program is sponsored by the USDA Food and Nutrition Service. 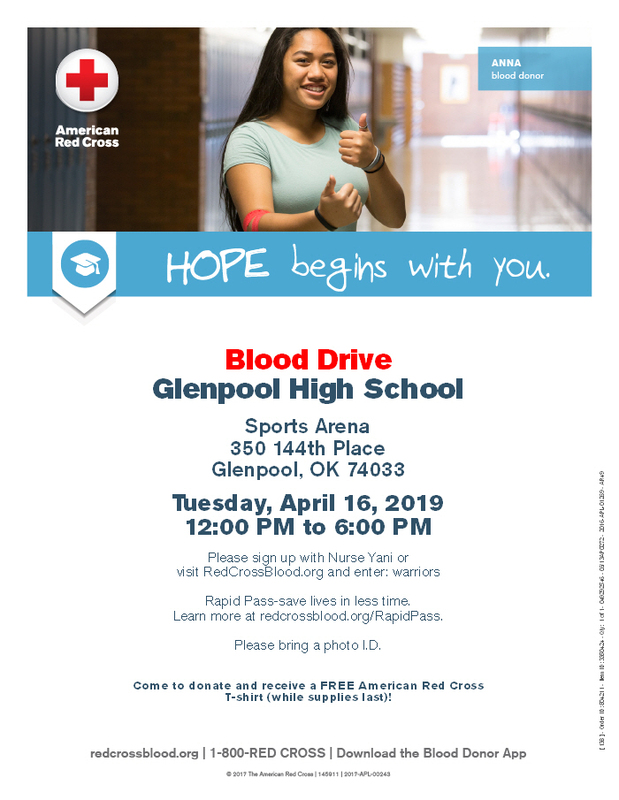 Glenpool Athletic Physicals will be Tuesday, May 14 in the Sports Arena. Up to date physicals must be on file in order for students to participate in any summer athletic activities and sports next term. Sports physicals are available for any student regardless of school enrollment in GPS. The fifth grade is creating a custom cookbook featuring Glenpool's favorite recipes. The cookbook will be professionally published. The money raised will be used for 5th grade educational supplies. Recipes were submitted by Glenpool staff and students. Cookbooks are still available for $12 each. Just fill out this order form and take the form and money to the elementary office. The Indian Education department held a banquet recently to present awards and scholarships to students.